Passenger air and freight traffic in Germany produces reasonable figures, but criticism of German air traffic is steadily increasing. Since mid-June, capacity bottlenecks have caused noticeable flight cancellations, delays and many dissatisfied customers. "Now all players in the industry as well as authorities and politics have to work on joint solutions," stated BARIG Secretary General Michael Hoppe last week at the general meeting of the association, which represents over 100 German and international member airlines. Passenger security controls, their efficiency, infrastructure bottlenecks at some German airports, as well as strikes and delays in air traffic led to engaged discussions among the BARIG airlines operating to and from Germany. Michael Hoppe, Robert Schickling, Managing Director Operations/COO of Deutsche Flugsicherung GmbH, and other representatives of the German aviation industry explained the background and discussed possible measures to counter the deficits. Concluding, the auditorium agreed that joint action has to be intensified for more efficient passenger security processes, border and customs controls, modernization and expansion of infrastructure and more capacity in airspace. Currently, the number of flights at some airports should not be increased further in order to maintain high quality and punctuality in German airspace and versus international competition. With these demands and the willingness to cooperate in finding efficient solutions, the airline members of BARIG are on a par with other players in the aviation industry. 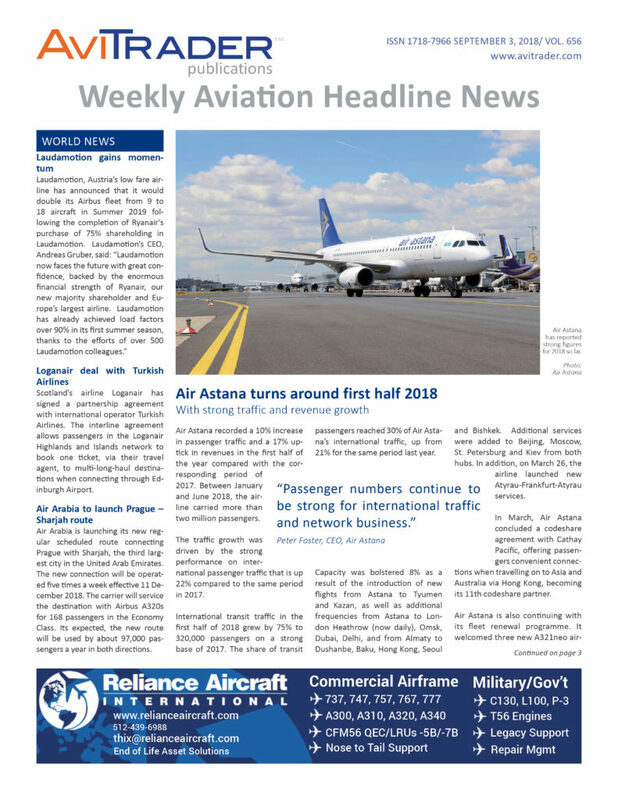 According to Airbus, Europe’s largest plane manufacturer, the company has delivered the Republic of Singapore Air Force’s (RSAF) first A330 Multi Role Tanker Transport (MRTT). The aircraft made its first official public appearance on Saturday September 1, 2018 at the RSAF’s 50th anniversary parade. The new-generation A330 MRTT extends the endurance of the RSAF’s fighter aircraft and ensures the service’s continued capability to provide air-to-air refueling support. It also provides the RSAF with greater cargo and passenger transport capabilities and enhances its ability to contribute to international humanitarian assistance and disaster relief (HADR) and peace support operations. Based on the successful A330-200 airliner, the A330 MRTT is a new-generation multi-role tanker which can carry up to 111 tons of fuel. It has the capacity of offloading 50 000 kg of fuel to a broad range of receivers during a 4-hour loitering mission at over 1 000 nm from its take-off point. Another typical mission is the deployment of fighter aircraft over a long distance. The A330 MRTT can support the deployment of 4 fighter aircraft plus 50 personnel and 12 tons of freight (luggage, spare parts and equipment) in one direct flight over 5200 km, e.g. from Europe to Afghanistan. Two new members have joined the VZM Management Services team on September 1, 2018: Johan Bank and Steve Williams. Johan Bank's last position was VP Engineering at KLM Engineering & Maintenance, where he has been MRO Director for Engine Services and Senior Chief Flight Engineer. His 40 years of experience in the industry, extensive experience with process improvement project focused on reducing turn times, quality and costs makes him an experienced change leader for all areas of commercial aviation maintenance and airline operation, both as consultant or interim-manager. Steve Williams' last position was VP Technical with PrivatAir. 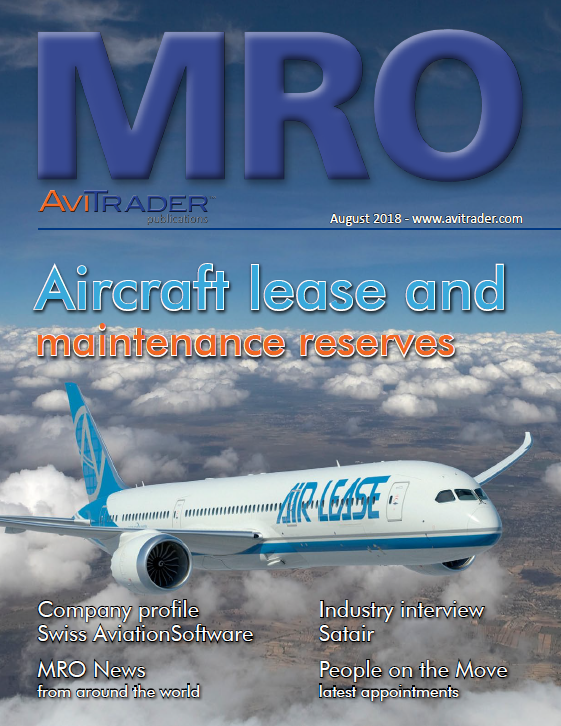 Since leaving Air Berlin in 2013 he has been involved in several projects covering both commercial and maintenance aspects of MRO and airline operations. His 38 years of experience, covering all areas of aircraft maintenance and airline operations especially regarding Line Maintenance and commercial aspects of maintenance services. It makes him an experienced change manager with a unique understanding of maintenance and commercial requirements of airlines and MROs. VZM Management Services is widely recognized to provide change leadership, interim executive management and business development advice to the aviation industry from their headquarters in the Netherlands and an office in Florida. VZM was formed in 1996 and has a broad international customer base. SAS has delivered strong results in the third quarter of fiscal year 2018, with earnings before tax of SEK 2 billion. The underlying earnings were more than SEK 0.1 billion higher than last year despite an increase of SEK 0.5 billion in jet fuel costs as well as SEK 0.1 billion in unforeseen costs in connection with operational challenges during the summer. The positive trend in earnings is a result of successful seasonal adjustments in the network, improvements in the customer offering and further enhanced efficiency. Kansai-based helicopter operator Hiaratagakuen has welcomed its second H145//BK117D-2, following the milestone delivery of its first unit in December 2017. Currently operating 14 H135s and one H145//BK117D-2, this new H145//BK117D-2 will join Hiratagakuen’s growing fleet to support emergency medical service (EMS) missions, and serves as a passenger and material transport. The first H145//BK117D-2 already entered service in June 2018 for aeromedical operations at the Nagasaki Medical Centre in Nagasaki Prefecture. With Japan’s full-scale deployment of air ambulances in 2001, EMS helicopters, otherwise known as ‘Doctor Helicopters’, have taken on more prominent roles in the country, enabling rapid evacuation of casualties from affected sites, and providing critical care without delay aboard medically equipped helicopters, while in transit to the medical facility. In 2010, the Kansai government implemented region-wide EMS support network and Hiratagakuen became its main operator of these life-saving missions. Today, there are over 50 helicopters supporting emergency medical missions in 42 prefectures across Japan. Boeing will build the U.S. Navy’s first operational carrier-based unmanned aircraft, the MQ-25 aerial refueler, through an US$805 million contract awarded on August 30. Boeing was awarded the engineering and manufacturing development contract to provide four aircraft. Boeing plans to perform the MQ-25 work in St. Louis. SHS Aviation B.V., the majority shareholder of the N.V. SHS Antwerp Aviation (VLM), has decided at an extraordinary general assembly to dissolve the Belgian airline and to liquidate it. Earlier this month it was announced that VLM would discontinue the connections to Aberdeen, Birmingham, Cologne-Bonn, Maribor, Munich and Rostock and that VLM would henceforth focus on business charter flights and the Antwerp-London City Airport and Antwerp-Zurich routes. Also the scheduled flights from Antwerp to London City and Zurich are now cancelled. The settlement takes effect immediately. Youri Steverlynck and Birgitta Van Itterbeek (Monard Law) were appointed as liquidators. They are responsible for the contacts with potential buyers. Dubai Aerospace Enterprise (DAE) has released that its Jordan-based engineering division Joramco has successfully obtained EASA Part 145 approval for the Boeing 787 aircraft type. The approval comes after Joramco obtained similar approval for this type from the Jordanian Civil Aviation Authority (JCARC) and the Federal Aviation Administration (FAA) in April of this year. Jeff Wilkinson, Chief Executive Officer of Joramco said: "We are very pleased to gain our EASA approval for the Boeing 787. This approval allows us to broaden our service offerings to a wider base of customers as we continue to build on Joramco's success as a leading MRO facility offering a globally competitive suite of MRO services." HAITE Aviation Training (HAITE), a wholly-owned subsidiary of Sichuan Haite High-Tech Co. of Chengdu, China (HAITE Group), and Malaysian Airlines Berhad (MAB) Academy, a subsidiary of the Malaysian Aviation Group (MAG), have come together to collaborate on the provision of joint commercial flight crew training services in Malaysia. A holistic aviation education institution that provides all aspects of airlines operations and management training, MAB Academy is endorsed by the Civil Aviation Authority of Malaysia (CAAM), and is a strategic regional training partner with the International Air Transport Association (IATA). The two parties signed a Memorandum of Understanding (MOU) on August 29, 2018 at the HAITE Singapore Aviation Training Center located in Changi Business Park. HAITE and MAB Academy will work together to develop and implement turnkey pilot training solutions to various airlines in the Asia Pacific. The companies will also explore the setting up of a joint venture to provide high-fidelity simulator training for commercial pilots. In addition, both parties will work towards conducting a Multi-crew Pilot License (MPL) program, and jointly explore the provision of cabin crew training equipment to MAB Academy’s new facilities. United Airlines will offer flights between Prague and Newark, New Jersey, right beside the largest American city of New York, from June 7, 2019 (June 6, 2019 in the U.S.). The new daily service will be operated by Boeing 767-300ER featuring both Economy and Business Class seats. The airport estimates the route will be used by approximately 43 thousand passengers a year in both directions. Under the 2019 summer schedule, there will thus be three regular scheduled connections to the USA operated from Václav Havel Airport Prague.